“You should be ashamed of yourself,” is a line all of us have heard at one time or another in our lives. The words have a powerful effect, no matter how much we hate to admit it. When said with a dash of harshness, that’s not harsh enough to provoke rebellion, these words can break us down, make us feel foolish, bad, and ashamed. Whether we are guilty or not, they can also touch such a sensitive core that makes us feel like children, again, being scolded by our grandmother. We don’t like feeling this way, no one does, and we all know this when we use it on others. Reveal to Justine Sacco, Lindsey Stone, Jonah Lehrer, and the cast of others that have been recently experienced worldwide shaming, via the internet, the basic plot of the 1973 version of the Wicker Man, and how it involves (spoiler alert) villagers sacrificing a man, by burning him alive, to provide for the coming harvest, and they may tell you that they would not be able to sit through such a movie. The correlation may not be perfect, but if you replace the harvest with social order and couple it with the proverbial act of condemning someone for the purpose of advancing a social order, those that have been regarded as sacrificial by social media, may experience such a wicked case of déjà vu that they may physically shudder during the final scenes of that movie. One of the first images that comes to mind when one hears about a group sacrificing a human for the common good is this Wicker Man image of a relatively primitive culture sacrificing one of their own to appease their gods or nature. We think of people dressed like pilgrims, we think of chanting, mind control, and individuals being shamed by the shameless. We think of arcane and severe moral codes, and the extreme manner in which they handled those that strayed from the collective ideal. Members of those cultures might still stand by the idea that some of these ritualistic practices were necessary. They might concede that the whole idea of sacrificing humans for the purpose of yielding a better harvest was ill-conceived, especially if they were being grilled by a lawyer on their agricultural records, but burning people at the stake, hangings, and putting people in stocks, however, were punishments they provided to the truly guilty, they might say. And these were necessary, they might argue, to keep their relatively fragile communities in line. 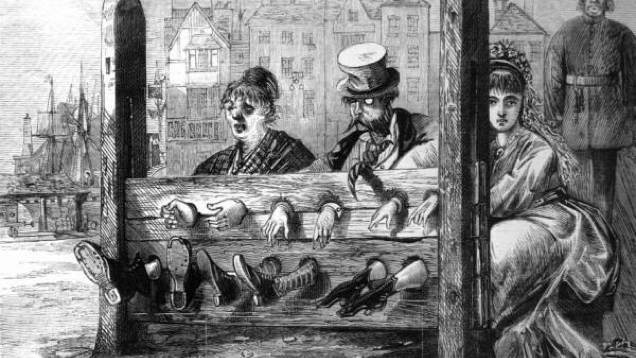 They might argue that such over-the-top displays of punishments were necessary to burn images into the mind of what could happen to those that are tempted to stray from the moral path. They might suggest that based on the fact that our law enforcement is so much more comprehensive nowadays, we cannot understand the omnipresent fear they had of chaos looming around the corner, and the use of shame and over the top punishments were the only measures they could conceive to keep it at bay. We may never cede these finer points to them, in lieu of the punishments they exacted, but as evidenced by the cases of the four individuals listed in the second paragraph, the greater need for symbolic, town hall-style shaming has not died. Our punishments may no longer involve a literal sacrifice, as it did in that bygone era, but the need to shame an emblematic figure remains for those of us that feel a call to order is justified to do whatever it takes to keep total chaos at bay. The conundrum we experience when trying to identify with how our ancestors acted is easier to grasp when we convince ourselves that these actions were limited to the leadership of those communities. We can still identify with a suspect politician, an inept town council, and a couple of corrupt and immoral judges, but when we learn that most of the villagers involved themselves in the group’s agreed upon extremes, we can only shake our head in dismay. Writers from that era, and beyond, describe the blood lust that occurred among the spectators in the form of shouts for someone’s head, and the celebratory shouts of “Huzzah!” that occurred immediately after the guillotine exacted its bloody form of justice on the alleged perpetrator. How could they all cheer this on? How could so many people be so inhumane? Some would argue that the very idea that we read history from a distance –believing that the human being has advanced so far beyond such archaic practices that it’s tough for us now to grasp their motivations– while engaging in similar, but different behaviors, is what makes the study of group thought so fascinating. No matter how one chooses to characterize this tweet, it’s tough to say that it’s the most inflammatory tweet ever put out on Twitter. For varying reasons, millions of people latched onto this statement and took this relatively unknown tweeter from 170 followers to the number one worldwide trend on Twitter, all while Ms. Sacco remained oblivious, in the air, en route to Africa. She received everything from death threats, people wishing that she would get AIDS as retribution for her heartlessness, and the varying degrees of near lustful excitement that began mounting among those villagers gathering around the intangible town square, imagining the look on her face when the lowering, technological guillotine finally became apparent to her when she landed, so they could all shout “Huzzah!” in unison. “I’m dying to go home but everybody at this bar is so into #hasjustinelandedyet. Can’t leave til it’s over,” was a tweet Mr. Ronson found soon after the publication of his book to illustrate the excitement that had been building among those that couldn’t wait for Ms. Sacco to land and discover that the life she lived prior to that tweet was now over. Before purchasing Ronson’s So You’ve Been Shamed book, one might be tempted to think that it is little more than a detailed list of those, like Ms. Sacco, that have committed purported transgressions. The fact that it is not, is illustrated by the decision Mr. Ronson made to focus on incidents that would’ve been considered inconsequential were it not for the varying reactions observers had to them. Ms. Sacco, for example, wasn’t inferring that she hoped that more black people contract AIDS, or that she hoped that the AIDS virus would continue to attack black people almost exclusively. One could say, reading her tweet literally, that she may have been intending to speak out against the infection for being racially biased. Perhaps it is the confusion regarding who, exactly, Ms. Sacco was condemning that led so many to fill in the blanks for their own purpose. Whatever the case was, they did fill in those blanks, and the pack mentality did frame that single tweet in a manner that encouraged tweeters, 24-7 news programs, and all of the other venues around the world to heap scorn and shame on her in a manner that could leave no observer with the belief that shaming is dead. It could also be guessed that Ms. Sacco was attempting to provide her followers poignant humor. Her tweet was, presumably, her attempt to garner empathy for sufferers of a disease that appeared unnaturally selective, and that she was probably attempting to spearhead some form of awareness among her 170 Twitter followers without sufficient regard for how it could be misinterpreted by those that would choose to misinterpret her tweet for the purpose of spearheading a movement to garner empathy for sufferers of a disease that appeared unnaturally selective. Those that responded on Twitter not only appeared to relish the opportunity to champion a cause, for greater definition among their peers, but to technologically burn whomever they had to to get there. And while we can only guess that most of the offended had to know that Ms. Sacco wasn’t intentionally infringing on their ideological issue, the opportunities to prove one’s bona fides on an issue don’t come along very often, and when they do they’re often limited to coffee shop and office water cooler conversations with two-to-four people. And those two-to-four people, are often forced to soft-peddle their outrage, because they will have to work around, or otherwise be around, the target of their condemnation in the aftermath. Ms. Sacco, on the other hand, was an intangible victim that most of those in the intangible town square would never meet, so they didn’t have to worry about her feelings, and her tweet provided them the perfect venue to establish their bona fides on a worldwide stage. “If we were in one of those Salem town squares witnessing a witch burning,” one of Ms. Sacco’s Twitter shamers might argue, “We would be shouting at the throng gathered around the witch, calling for them to be burned, and not the alleged witch. We’re not shaming with the sort of moral certitude of those people of a bygone era, we’re shaming the shamers here. It’s different!” They might also argue that their goal, in shaming the Justine Saccos of the world, is to not only to redirect shame back on the shamers, but to effectively eradicate the whole practice of shaming … unless it’s directed at those that continue to shame others. If that’s true, then no one angrily wished death and disease on Justine Sacco, but they felt a need to sound more brutal than any that had tweeted before them to establish their bona fides on the issue. They weren’t angrier than any of the previous tweeters, they were just late to the dog pile, and they felt a need to jump harder on top of the pile to generate as much impact as those on the bottom had with their initial hits. The idea of the target’s guilt, and the severity of her guilt, kind of got lost in all of the mayhem. Each jumper became progressively concerned about the impact their hit would make, and how it would define them, until they felt validated by the proverbial screams of the subject at the bottom of the pile. If you’ve reached a point, in this conversation, where you’ve recognize the different, but similar shame tactics employed by the primitive and advanced societies, you’ve probably reached a point where you’ve recognized the correlation, and you’re shaking your head at both parties. In his book, however, author Jon Ronson cautions us against doing so. It’s not about them, the central theme of his book suggests, it’s about you, him, and us. In one interview, he stated that he thought of pounding that point home by simply calling the book “Us”, but that he feared some may infer that meant that he was specifically referring to the United States, or the U.S. The subjects of shame, and the shamers that exacted their definition of justice on them, he appears to be saying, are but anecdotal evidence of the greater human need to shame. It’s endemic to the human being, to us, and while the issues may change and evolve, and the roles may reverse over time to adapt to the social mores of the day, the art of shaming remains as prevalent among the modern man as it did during a B.C. stoning. The elephant in the room that Mr. Ronson did not discuss in his book is the idea that the viciousness the modern day shamed person experiences may have something to do with the vacuous hole created by the attempt to eradicate shame from our culture. Our grandmothers taught us this very effective tool, as I wrote. They used it to try and keep us on the straight and narrow, and they did it to keep us from embarrassing ourselves. When we witnessed our childhood friends engaging in the very same behavior that we had been shamed into avoiding –thus displaying the fact that they hadn’t been properly shamed against such behavior– we stepped in to fill the void. We shamed them in the manner our grandmother had, using –as kids often will– the same words our grandmother had. We then felt better about ourselves in the shadow of their shame. As adults in a modern, enlightened era, we learned that we are no longer to use the tool of shame. The lessons that our grandmother taught us, we’re now being told, were either half-right, or so baked in puritanical, traditional lines of thought that they no longer apply. Ours is an advanced, “do what you feel” generation that struggles to believe that there is no right and wrong, unless someone gets hurt. The benefit, we hope, is that if we eradicate judgment and shame from our society, we can also be liberated from it. Yet, there is a relative line in the sand where attempting to avoid judgment and shaming will eventually, and incidentally, encourage that activity. We all know that this activity will eventually lead to internal decay and rot for the individual, and eventually the culture, and we know that some judgment and some shaming is necessary to keep the framework intact. It’s a super-secret part of us that knows this, and the need to shame and judge gnaws at us in a manner we may never knew existed, until that perfect, agreed upon, transgression arises. When it finally happens that we find someone that it’s safe to shame, it fills that need, and that pressurized need that we’ve hidden so far back in the recesses of our minds in a quest to acquiesce to the new ways of thinking that the act of shaming explodes on that person, regardless of their degree of guilt. Those of us that have learned some of the particulars of the Salem Witch Trials believe that early on in the situation there may have been a need for greater order. The fear of chaos probably prompted them to believe some of the accused actually were witches, looking to infiltrate their youth with evil. As we all know, it eventually began spiraling out of control to a point that people began randomly accusing others of being witches over property disputes and congregational feuds. One can also guess that many accusers leveled their accusations for the purpose of attaining some form of superiority over the accused that they could not attain otherwise. Those citizens of colonial Massachusetts eventually learned their lessons from the entire episode, and some would say their lesson is our lesson as of yet unlearned, as accusations of racism, and anti-patriotism, are leveled at those that may have been guilty of nothing more than a poorly worded joke, or participating in an ill-advised photograph, as in the case of Lindsey Stone. Our era is different though. The lessons of the self-righteous, puritanical man do not apply to today, and we don’t need to know the whole story before we make that leap to a defense of the social order that provides us the characterization we desire in the dog pile? ← Innocents Abroad, or Innocence Aboard?